Peter specializes in empowering individuals and organizations to increase success and profits while providing values-focused customer service. Peter will help you to unpack your situation, decide the best approach and get maximum results. I can help new landlords prevent future conflict and help seasoned landlords deal with tenant crises. 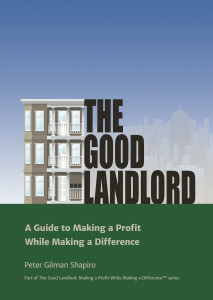 Good landlord training programs are designed to meet your needs and can be presented as a 1 hour ‘lunch-and-learn’, 1-2 day seminar, or by monthly retainer. Join an engaging monthly support group in which landlords present their situations, fellow landlords respond and Peter provides information and advice. Landlords leave ready to take action. Video trainings for landlords and property managers; from beginners to veterans - everyone will have substantial take-aways.